What does Palestine’s signing of 15 international treaties mean? On 01.04.2014 the Palestinian President Mahmoud Abbas signed letters of accession to 15 multilateral treaties and conventions. Why did they do this and what does it mean for the peace process? Israel accuses Palestine of “unilateral” behaviour. Yet this is not true. Palestine may sign these treaties and conventions since they obtained observer state status in the UN General Assembly in November 2012. This in turn means that Palestine’s step is not “unilateral”, but indeed a right granted to them by the global society. In July 2013, the PLO took the difficult decision to postpone accession to multilateral treaties and conventions in exchange for the release of 104 pre-Oslo prisoners in four stages. In fact, the release of pre-Oslo prisoners is a commitment Israel had already made 20 years ago as part of the Palestinian Israeli interim accords (Oslo accords), again in 1999 through the Sharm al-Sheikh Agreement and a third time at the beginning of the current negotiations. The fourth and final release of 30 prisoners was set to take place on March 29th 2014. When Israeli officials indicated that Israel would not go through with the release, the PLO asked that the US administration ensure that Israel fulfills its commitment. Since Israel failed to release the last group of prisoners, the State of Palestine is no longer obliged to postpone its rights to accede to multilateral treaties and conventions. The nine months is not over yet. Doesn’t this mean the Palestinians are breaking their commitment? No, this does not mean that negotiations process is over. President Abbas made this point clear during his announcement on Tuesday April 1st. Indeed, the PLO remains committed to this nine month process, which ends on April 29. Despite the escalation of oppressive Israeli policies such as the killing of Palestinian civilians, settlement construction, raids on vulnerable communities, arbitrary arrests and detentions, home demolitions and the removal of residency rights, we remained committed to the negotiations process and supported US efforts. There are a total of 63 treaties, conventions and agencies that the State of Palestine may join and will do so in the best interests of its people, as and when it sees fit. This is a right that all UN member and Observer states have. Isn’t this just a unilateral step so the Palestinians can reject an agreement? No. This is the fulfillment of Palestine’s right and has nothing to do with negotiations or the reaching of an agreement. 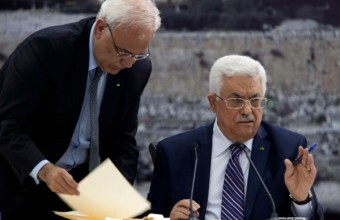 As President Abbas expressed during the announcement, the Palestinian position remains unchanged. The PLO seeks to achieve an independent and sovereign Palestinian state on the 1967 border with East Jerusalem as its capital with a just solution to the refugee issue based on UN General Assembly resolution 194. It will use all legal means to achieve this, including negotiations and peaceful popular resistance. Doesn’t this undermine US and international efforts? No, Palestine does not want to clash with anyone. The tools it uses are legitimate and non-violent. The PLO bases its action on international law and the fulfillment of the long overdue and inalienable rights of its people. The Israeli government needs to understand that negotiations are a non-violent tool to achieve peace, and not a smoke screen for continued human rights violations and the expansion of settlements that makes a two-state solution increasingly impossible.